The Rebuy Stars Casino Savarin in Prague organizes a € 400,000 Czech Poker Championship in March! 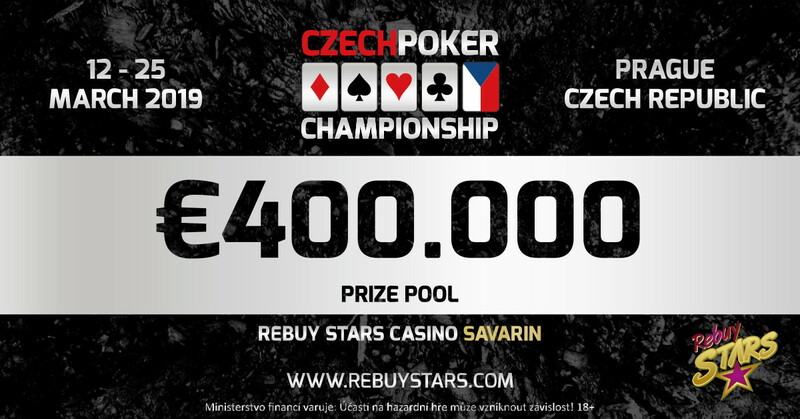 After 2018 it is already a familiar amount of € 400,000 guarantee, which will be given away in the Rebuy Stars Casino Savarin in Prague from March 12th to March 25th as part of the Czech Republic Championship! The prestigious festival will bring the € 200,000 Main Event of the Czech Championship, a high class field at the High Roller , creating a minimum prize pool of € 40,000 or the Czech Cup with a prizepool of € 60,000. In addition to the dream figures, the title of the Czech champion is also in the game. Beside the four main events, you can find many Side Events and Satellites, which are completing the total festival guarantee of €400.000. You must definitely not miss this year’s poker holiday! The four tournament specials are proud of the high prizepools! 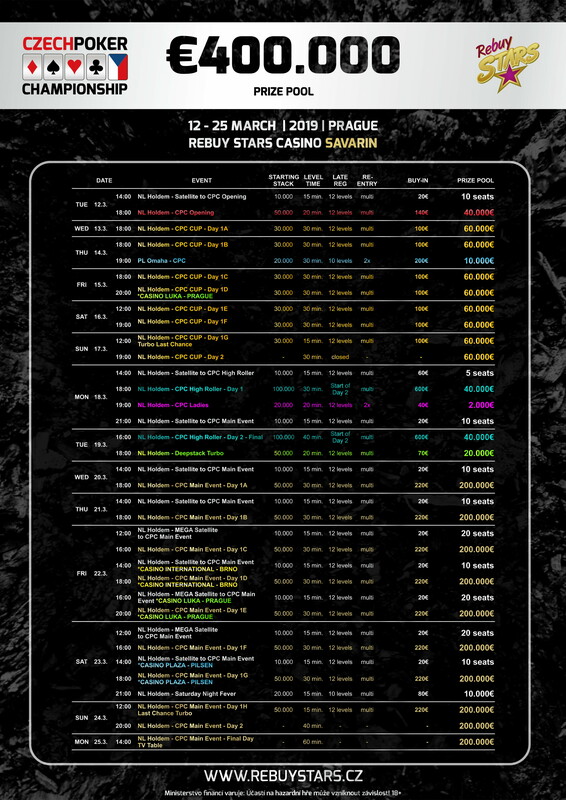 The Czech Republic’s Main Event will guarantee €200.000 from March 20th to March 25th. You can win and take the chance to play for a buy-in of € 220. CPC High Roller, crowned by € 40.000, will be played from 18th to 19th March. The buy-in is €600. 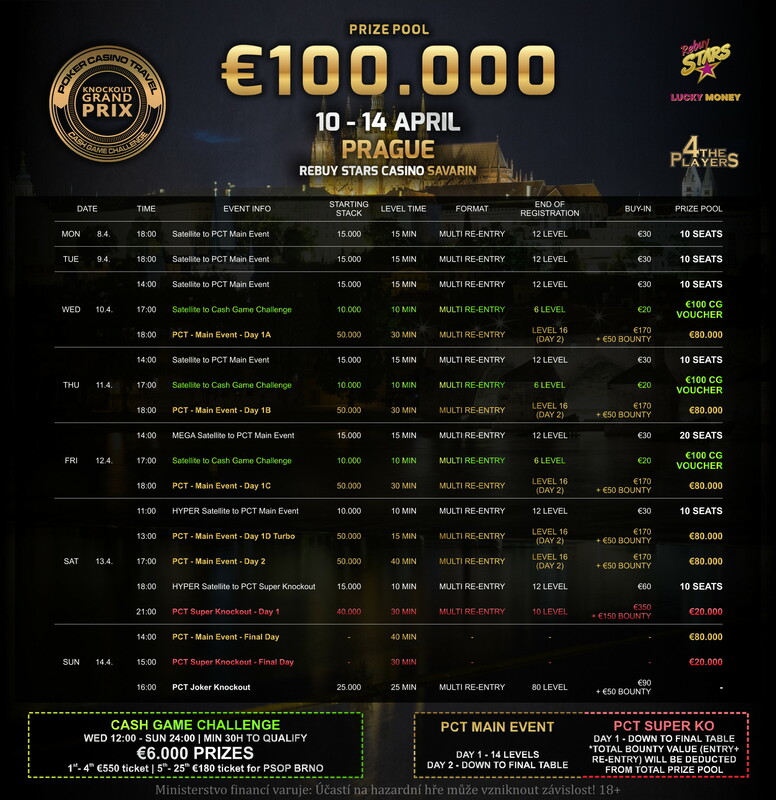 The CPC Opening Event with a prize pool of € 40,000 !! takes place on March 12 with a buy-in of € 140. These are the four big highlights of the festival, but also Omaha players or ladies will get their money’s worth and certainly one or the other turbo is there for them!